Go forward in time to March 2006. Semester over. Learned a lot, survived to oral exams in German and English, and got very good records. My plans to go to GUADEC this year are under danger. I have to write the Test-DaF (test of German as foreign language) in June 27th here in Dresden (and GUADEC will be from 24th to 30th). The Test-DaF is the main requirement for foreign students that want to apply to a study program in Germany. I have the chance to write it in that date in Dresden under the sponsorship from DAAD (the test costs like € 170, that DAAD will give back to those scholars who pass it), so I won't have such a good opportunity again. Bad luck. As I will to come back to Germany in the future and make postgraduate studies, I need to write this exam someday. Which better opportunity than after one year practicing German in Germany? and probably for free? I will try to talk with the DaF people in the university to see if I could write it a week sooner or later. Anyway, I think it won't be possible, because the DaF exam dates are worldwide fixed. Ich hab ein hässliche Glück, oder? Got new books today! I have now a big collection of Germany history books, including «Der Erste Weltkrieg und das Ende des Kaiserreiches», «Kleine Geschichte der Weimarer Republik», «Potsdam 1945», and «Kleine Geschichte der DDR». This would give me an overview of the German history during the past century, if I could manage to find some time to read them. Exams are approaching. Last week all my lectures finished and I arranged the exam meetings with the corresponding Professors. It's not going to be easy, but I won't complain. I am studying very hard. We'll see. The weather in Dresden is very ugly these days. The temperatures goes from 1°C to -1°C and I just hate it. I love when it is rain, and I love when it is snow. But that mix between rain and snow that keeps everything between white and wet, it is pretty ugly. Could we just go back to the -5°C of the last weeks, please? It is much better. Last Monday was a beautiful day, with -10°C and clear skies. 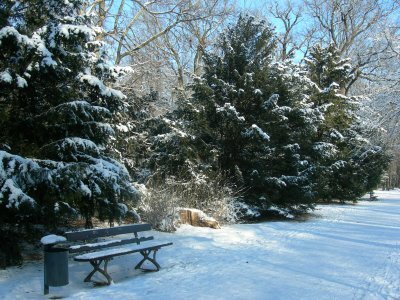 I took one hour in the morning and went to Großer Garten and made some pics of the snowy park. I have just one more filter for my coffee machine. This is what I would call panic-state alert. Today, I added to gyrus support to detect and show mailboxes that are possibly orphaned. Normally, if you delete claudio.gyrus-list from your mail account, your client should delete claudio.gyrus-list.pending-issues, too. But sometimes, that doesn't happen. It could be because of bad clients, or simply because the admin telnet'ed the server and deleted the parent mailbox without deleting all its sub-mailboxes. Any case, the result is an orphaned mailbox that sometimes is unreachable to clients. 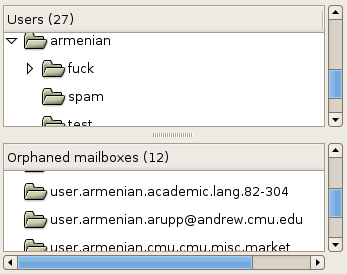 A special case of orphaned mailboxes occur when a user creates a mailbox whose name includes the mailbox hierarchy separator (for example, when the hierarchy separator is "." and Joe user create a user.joe.my.lovely.emails mailbox). Now gyrus, each time that finds a mailbox that doesn't seem to fit in a sane mailbox tree (i.e., where every mailbox has a parent), takes it and put it in a separate view, so the admin could know that there are mailboxes that need to be reparented or deleted. The next step will be to implement the delete and reparent functionality. The delete one is not really different from the one for sane mailboxes, but the reparent could be very tricky. Code, as usual, is in the CVS. Finished reading Kurt Vonnegut's Slaughterhouse Five, a science fiction novel whose main event is the Firebombing of Dresden during the end of World War II. From an historical point of view, there is not too much said in the book about the bombing nor the war, but the alternating plot line, the misery of the main character, and the sarcasm of Vonnegut make this book a very interesting piece. After reading it, you can feel the post war confusion that must have affected survivors of the Dresden crime. Go backwards in time to January 2006.